A week ago Saturday, before I was ill, I was out riding my bicycle around Krungthep and enjoying the relatively cool weather. After visiting the train station to see the steam locomotives, I pedaled around various districts, snapping shots of interesting things. 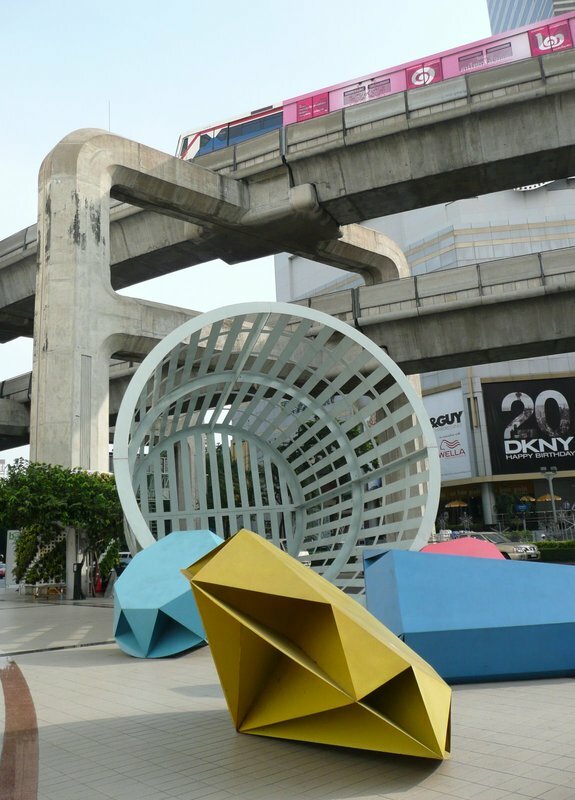 The four corners of the intersection of Rama I and Payathai Roads are fill with Siam Discovery Shopping Center, Siam Square Shopping Center, MBK Shopping Center and the Bangkok Art and Culture Center, our just over a year old museum of contemporary art. A large public plaza lies in front of it. 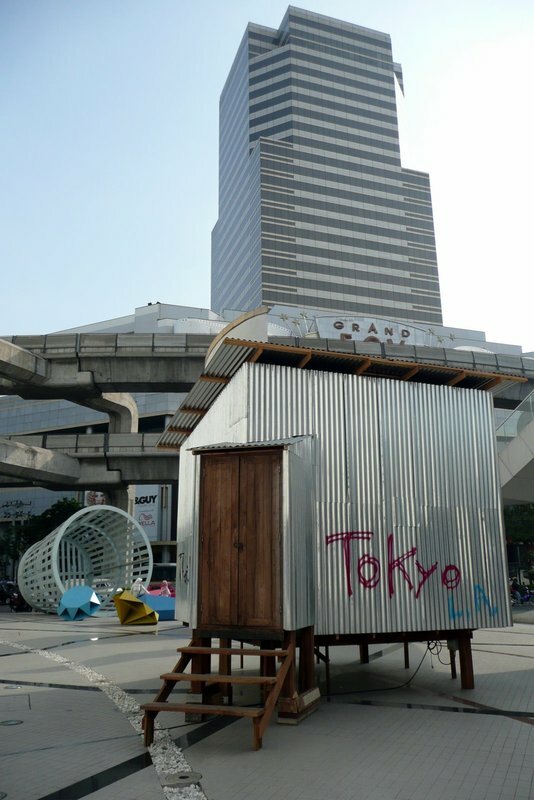 There are currently several pieces on display including this metal shack that has the names of major world cities spray painted on it. Another piece, ostensibly a meditation on consumerism, is made of these giant sheet metal origami gems spilled out of a huge wastebin. It is actually fascinating to see how they are constructed and how effectively they resemble cut-glass gems when viewed from a distance. Heading further west down Rama I Road (which turns into Ploenchit and Sukhumvit Roads if you continue to the east) I encountered this caravan of tuks tuks heading to the royal plaza of Sanam Luang in celebration of His Majesty the King’s birthday, which was that day. 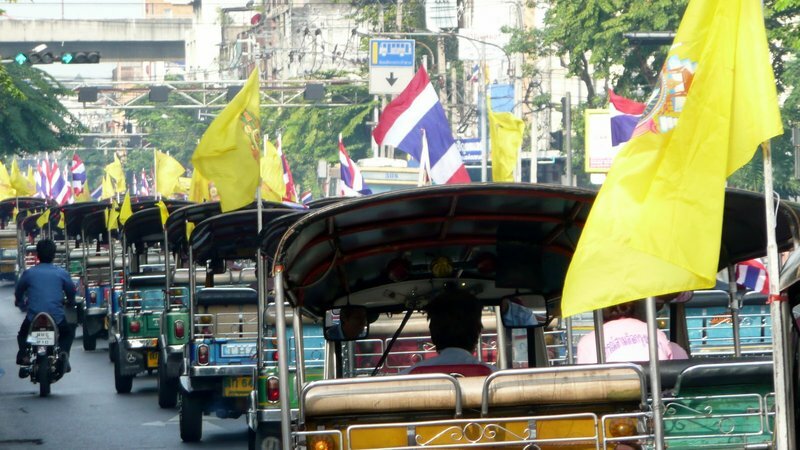 They are decked out in Thai flags and the yellow flag featuring the royal crest of King Rama IX. 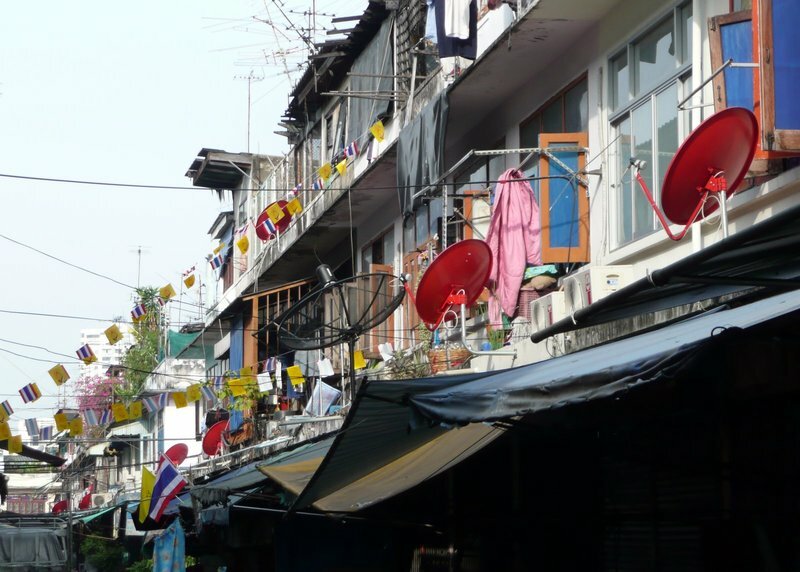 Not far away, in the Chula neighborhood located back behind National Stadium, are these narrow soi which shop houses lining them. I found the line of this roof fascinating with so many repeating shapes and textures and colors. Another neighborhood near the train station, just on the edge of Yaworat, Chinatown, is clearly a Chinese community. 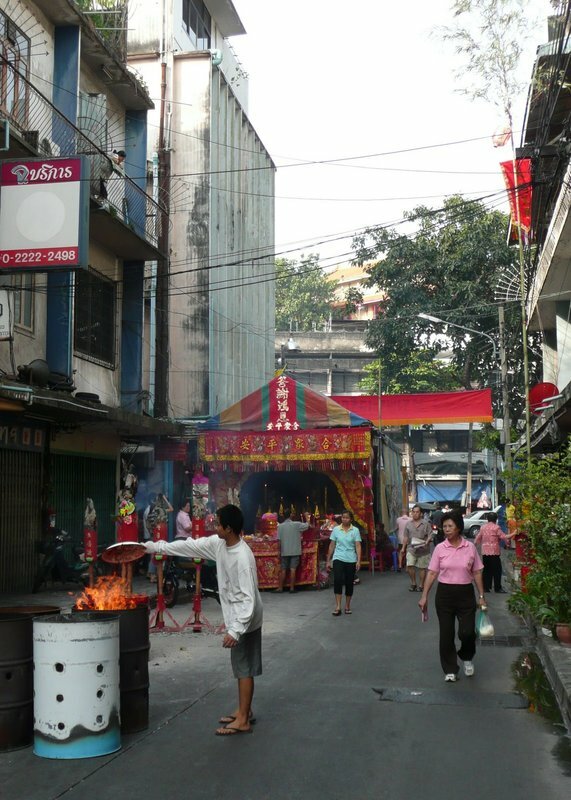 This single block was in the midst of some festival with locals making merit and offering gifts to the gods. Evidence that the Chinese, while very integrated into Thai society as a whole, still maintain some distinct cultural practices. Very vibrant area and fun to ride through. Also near the train station is the entryway to a “Turkish bath,” as these dens of illicit pleasures are sometimes euphemistically called. This is actually on a pretty main thoroughfare and each time I drive by this wood carving catches my eye. I think it is tremendously kitschy, something out of the 1970s in a Trader Vic’s sort of way. This entry was posted in Uncategorized and tagged Bangkok, Krungthep, Neighborhoods by christao408. Bookmark the permalink. The giant origami jewels are so cool. I’d love to see how they actually made them! I find the pink sky train (isn’t that what the metro is called there?) really weird! Have you ever been in a Turkish bath? Such a fascinating place. These are things I like to see; when you just go about there, showing us interesting things. @Dezinerdreams – Yeah, the elevated one is the Skytrain. The underground one is the BTS or Metro. This one is pink only because the advertisement wrapped on it is pink. They come in all colors of advertising. @TheCheshireGrins – I’m curious if they folded or cut and welded. From the looks of it, they are folds. A friend worked for a company whose proprietary technology was a type of laser engraving on sheet metal that would enable it to be folded like a sheet of paper. Very cool technology. @Roadlesstaken – Never been in either a real one or a fake one. @Wangium – Bicyclists fall into two categories here: the mom and pop locals who are pedaling an ancient bike a few blocks the wrong way against traffic, and the (mostly) locals who are riding nicer bikes and in few gear with a helmet. Most of the later group cycle for fun and mostly on weekends although there are some who commute. Compared with SF, though, the numbers are tiny. @arenadi – This entry is kind of a good peek into my mind as I go about life in the Big Mango. I see things and make note of them, observing them and trying to understand them from a local perspective, even though I know I am an outsider. Glad to hear that it is the type of thing you enjoy reading about. @yang1815 – You’re welcome. How’s settling back into Omaha? @christao408 – Slipping and falling in freezing rain and snow weather haha. Trying to stay warm that’s all! I always enjoy your insights into the city. It’s a lot better than any travel sites. Thanks! I agree with Matt. Your travelogues are really stimulating and very vivid in their description. I am e mailing this to my friend who is going to Thailand end of January with her extended family. You had said earlier that you could send a list of some good eateries in Bangkok. If possible could you do that Chris? I will forward that to her also. I think you have my e mail address. Thanks. Even if the “Turkish Bath” sign is not high art at least it isn’t hideous flashing neon “Girls Girls Girls”… I like the sheet metal jewels too. Nice to see your sights around Krungthep again, especially around His Majesty’s birthday. I remember there are tons of gold retails shops in Chinatown. Is it still the same? Thanks for sharing these photos of life in Thailand…it is so much more than tourists experience. @jandsschultz – Well, I keep trying to get the tourists to ride with me but they are hesitant. @Redlegsix – Som lois (sam loys?) would be an accurate description. I wonder when the change to tuk-tuk, which describes the sound they make, happened? @CurryPuffy – Still lots of gold shops in Chinatown. In fact there was a recent article that many are having problems financially because everyone wants to sell their gold at high prices but nobody is buying. don’t have enough cash to sustain that. @murisopsis – Yes, just a touch more tasteful than flashing neon. @ZSA_MD – Have already sent to you. Let me know if they have any more questions. Also, a box arrived from you today. Am I supposed to go ahead and open it or wait until Christmas? (Which I realize you don’t celebrate, but I’ll double-check anyhow. )@ElusiveWords – That’s very nice of you to say, Matt. Thank you. @christao408 – It doesn’t matter when you open it. It is a tiny, very tiny little something for your beautiful home Chris. I am glad it reached you. I do not celebrate Christmas, but get involved with the flow of the season. have a beautiful Holiday my dear friend.I sent the email to Sasi my friend. She was amazed at the work you put into it. She will keep it with her along with your email address, in case she has any question. Thank you. @ZSA_MD – You’re welcome and thank you, too. I’ll open the box when Tawn returns home this evening.